This is a beautifully bright and unapologetically sunny book. It's big and colourful and the photos are just gorgeous. The most amazing thing about the photos in this book is that when I've cooked from it, my food looks just as good as the photos! One thing I really liked was the introductory recipes. Instead of the usual chicken stock and salad dressing, Marden gives us recipes for things like preserved lemons and chili oil. It's all still basic and quite simple, but these are things I wouldn't have thought to make myself, and if I had, it would be one of those 'look it up on Google' things. I'm glad I now have a reference section in print to leaf through if I need it. So far, I've made four things from this book: lemony greek potatoes, peppery rib eye, balsamic roasted chicken and the watermelon radish, beet and mozzarella salad. Everything turned out pretty good. I was disappointed with the citrus dressing on the radish salad-- it was bland and the salad didn't come together into anything. It just tasted like, well, radishes, beets and mozzarella. Not that those things taste bad, mind you. I'm not a big fan of salads and general, and I really need my salads to be composed. I love it when a dressing just sets the rest of the ingredients off into greatness, and that didn't really happen here. The rib eye and chicken were both tasty. I can't comment too much on the rib eye as I forgot I was following a recipe and just eyeballed amounts, which I think pretty much invalidates my opinion on this subject. Marden mentions in the chicken recipe that she originally thought soaking a chicken in balsamic vinegar would make it too salty (me too, Melia!) but she came around. I thought the balsamic notes were a tiny bit overpowering, but the flavour was excellent and it's an idea I haven't come across before. The standout were the potatoes. They had just the right amount of lemony goodness and were beautifully crisp. I didn't have grapes, which were called for, so I substituted raisins and it worked for a little bit of sweetness. I have no doubts that grapes would be much better. This recipe really hit the spot for Greek-style potatoes, and it's one I will definitely use again. While I was generally happy with how the food tasted, I felt like everything was just one step away from greatness. It was pretty good, but not amazing. Even when cooking, the food from this book looks gorgeous. It doesn't take any extra steps-- just the combination of colours and shapes come together really beautifully. I was continually blown away by how pretty everything was all the time and just stared at the beets when they were in the oven for a couple of minutes. The recipes are fairly simple with short ingredient lists and lots of lemon and salt, perfectly Mediterranean! Some online reviews mention there aren't enough recipes and are too many stories, but I didn't get this feeling. There's a decent amount of variety and definitely enough recipes to keep you busy for a while. It's definitely not recipe-dense, but as long as you're not looking for a tome on Mediterranean cooking, I think you'll be OK. This book feels like the Mediterranean to me. It's full of sunshine and lemons and salt.The oversized format, bright colours and simple layouts really reflect it's content well. The food showcases ingredients in simple preparations which is so quintessentially Mediterranean. 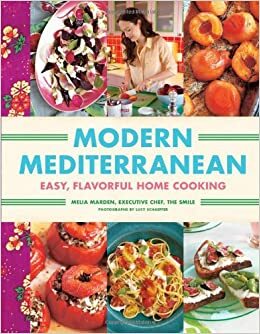 It doesn't have some expected recipes, like moussaka or souvlaki (Marden's familial influences are mostly Greek), but I didn't miss them with all the other great stuff she's packed in here. Even though this is a regional cookbook, there's a lot of familiar-sounding ingredients and preparations. In my opinion, Marden really nails both the modern and Mediterranean aspects that she's going for. Get the recipes for Moroccan chicken with preserved lemons and olives and a Moroccan champagne cocktail! SUMMARY. This book just hits the right notes for modern Mediterranean cuisine. I really like the size (although this is absolutely a question of preference) and how colourful everything inside is: the type, the photos and the food. The food is on the more familiar, fusion sort-of side as opposed to classic Mediterranean dishes, and there is a heavy focus on Greek. It's got some relatively unique recipes in there that are worth a look. Buy it if you like pretty food and want some fresh riffs with a Mediterranean twist. A beautiful book with fresh takes on Mediterranean cooking. (c) 2015 Jyoti Sidhu. Powered by Blogger.